Have you seen the movie “Little Buddha?” It tells the story of a young American boy who was chosen as a child as the reincarnation of the Buddha, known in this life as “His Holiness Buddha Maitreya”. He began making meditation healing tools from a very early age in the way of the age old Tibetans, and continues to offer these tools worldwide to help bring healing and transformation to the world. I discovered Shambhala Healing Tools in 2008 when visiting the US for a Healing Conference. I was shown the beautiful crystals with the magnets and wire wrappings in meditation prior to the trip, but was still in awe of the wonderful healing energies transmitted from the tools. I was drawn to a clear crystal with silver wire, which has been used HEAPS for myself, family and friends particularly helping with pain relief. It is so easy to use – my grandchildren ask for the weaver when they have scraped their knee or have an insect bite, and they love to see the swirling crystal as it weaves the pain away. I LOVE the invocations and meditations from Buddha Maitreya, and that profits raised go to supporting charitable projects in Tibet, China, India and Nepal as well as in the West. I now have a range of etheric weavers, pendants, earrings, solar crosses, mats, vajras and pyramids available for sale in Australia. Note: free CD with every purchase (save $15). 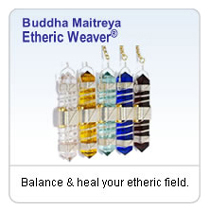 The most popular healing tool is the Buddha Maitreya Etheric Weaver® - they are simple to use and can be used by anyone. For treating other people they may be held over any part of the person’s body to help with any symptom or problem, whether physical, emotional or mental. The tool will move in gentle circular motions like a pendulum whenever there is something to treat. It will stop once the energy flows in a balanced way. Many medical professionals, nurses, doctors, acupuncturists and massage therapist are starting to incorporate the Etheric Weavers into their practice. No training is necessary and anyone – from all ages and backgrounds – can use the Etheric Weavers for physical, emotional, mental and spiritual wellbeing. 3.5" weavers available in a variety of colours/wire wrapping choices (copper, silver, gold) and priced from AUS$230 plus postage & packing. Available for immediate delivery. Don't forget to order your free CD. 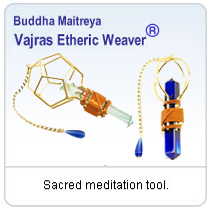 The Vajra Etheric Weavers® are designed to be used either as an Etheric Weaver or as a Vajra. They are simple to use and can be used by anyone for meditation, self-healing or healing others. The Vajra Weaver is based around a 3.5" or 7" Siberian quartz crystal, with gold plated neodymium rare earth magnets placed at the centre point. The crystal is wrapped with copper, silver or gold wire. Sky - the Sphere Aligns to the relationship of Heaven on Earth. Earth - the Star Tetrahedron aligns to the Earth, the tetrahedron of Mind & the tetrahedron of Matter. Christ Principle - the Dodecahedron aligns to the Christ Principle, the sacred geometric pattern of human consciousness. Click on the link below to see which items are available now or enquiries welcome. 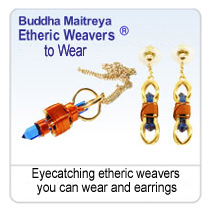 Small Buddha Maitreya Etheric Weavers® and Earrings are available to wear. They are small etheric weavers with quartz crystal, centrally placed magnets, and a wire wrap of your choice. Far more than jewellery or just for show, these unique metatronic tools are designed to be worn daily or may be taken off and used pendulum-style as an etheric weaver. For me wearing the etheric weaver helps to maintain a deeper state of peace and positivity. 1.75" pendant from AUS$135 plus postage & packing. Variety of colours/wire wrapping choices available for immediate delivery (copper $135 - silver $185 - gold $250). Click on the link below to see which items are available now or click on the link below to send an enquiry. 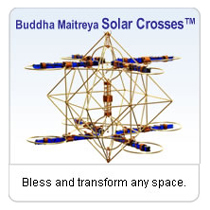 Buddha Maitreya Solar Crosses™ are designed to be hung from the ceiling or set in a room. The Solar Cross radiates energy out from itself to enhance your home or the place where it hangs. It heals your home, anything in the home, and all the relationships in the home. Hang it in your home or use for personal healing. Small range of mini, small, medium, large available for immediate delivery. 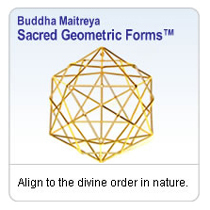 The Buddha Maitreya Sacred Geometric Forms™ are used for meditation, healing and to attune to the soul. The tools are a form of energetic, vibrational medicine that helps a person attune to their higher mind, their soul or 'Buddha Nature' - the divine enlightened essence within all beings and things. Meditating with the form is thought to help to awaken higher energies and raise consciousness, allowing for the deepest levels of meditation, relaxation and healing. Small Adam's Earth Grid AUS$725 plus postage & packing. 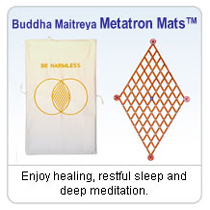 The Buddha Maitreya Metatron Mat™ is a powerful, portable healing and meditation magnetic mattress pad designed to lay on top of a mattress, chair or massage table. Used for healing, self-healing, restful sleep and deep meditation, the mat combines the sacred geometric proportions of the Vesica Pisces together with an electromagnetic grid. Full mat - AUS$1250 plus postage & packing; half mat - AUS$850 plus postage & packing. Ask Susan about the special package to include vajras. The Buddha Maitreya Vajra™ is a 24k gold or sterling silver plated hand held meditation healing tool based around the etheric weaver and applying sacred geomancy. There are many different sacred geometric designs to choose from. Hold in the palm of the hand and use for meditation, self-healing and prayer. 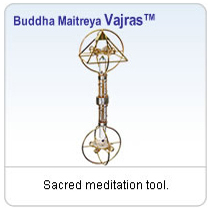 Use individually or as a pair used in combination with a Buddha Maitreya Metatron Mat™. "The Vajra helps you to help others and take the time to help yourself to choose a healthy life" . Small range of colours and designs available for immediate delivery - from AUS$265 plus postage & packing. 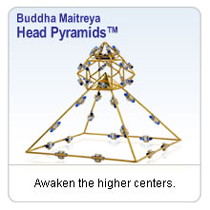 Buddha Maitreya Head Pyramids™ are worn on the head for meditation and healing, hung in a room, or placed over pictures, vitamins/supplements, food/water to bless and revitalize them. Perfectly handcrafted, these 24K gold plated, 3-dimensional sacred geometric meditation forms can be worn during meditation - put on a headset, listen to the meditation or music and relax as the music vitalizes the natural healing energy of the head pyramid. Small range of colours and designs available for immediate delivery - from AUS$1340 plus postage & packing. 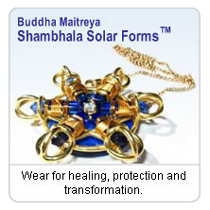 Buddha Maitreya Shambhala Solar Forms™ are designed to be worn all the time to help a person truly heal themselves. They are highly spiritual and blessed etheric weaver combinations that help meditation and healing to become a daily reality - leading to more joy and vitality and furthering a meditative state that allows one to be more in the moment and more able to respond. There are 8 different sacred geometric designs to choose from available in a variety of different metals (24K goldplate, sterling silver, 18K yellow or white gold, platinum). Choose the form you are most attracted to - whether its the geometry, metal, color, gems or simply the overall 'feel'. A small range of colours and designs is available for immediate delivery - from AUS$395 plus postage & packing, or why not design your own? To see which items are available for immediate delivery, click on the button. To ask a question about any products or choose your own favourite combination, click on the button. To order, click on the 'Send Enquiry' button to email your order or enquiry. Please state clearly which product you are interested in and your preferred colour and wire wrap (copper, silver or gold). An email will be returned confirming availability and price plus the terms & conditions of sale. Don't forget to nominate which FREE CD you would like to receive with your order - titles include: Great Invocation; Meditation of the Soul; A Soul I walk on Earth; Archangels of Heaven; Maitreya’s Song; The Seven Rays of God; The Coming Destiny. For more information about Shambhala Healing Tools, go to the website www.shambhalahealingtools.com.